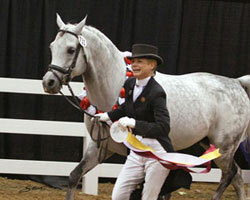 The competition for this year's top stallion at the SHNs came down to the last class! In the lead going into the Saturday night classes was KB Omega Fahim with two National Championships, but with Mirage V, Al-Marah Asterisk, and Annapolis all close on his heels. And all three of them were in the finals of the Open SHUS, whereas KB Omega Fahim was done and relaxing in his stall, hooves crossed that the other three wouldn't place higher than a Top Ten Saturday night. But all THREE of them did place in the Top Ten, putting Mirage V in a tie with KB Omega Fahim and all three within range to take the top honors if placing Champion or Reserve. With Omega holding his breath, the Reserve Champion was announced as Mirage V! 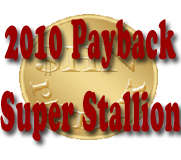 Making him the most winning SHN Payback stallion at the show with two Reserve Championships and Three Top Tens! Congrats to all for a very successful show!!! Mirage V has been awarded his Super Stallion trophy, ribbon, and custom embroidered cooler, donated in memory of the 2008 Top SHN Payback Sire, Bey Oro, owned by Mark and Tania Dunlap of Spring Valley Ranch in CA.